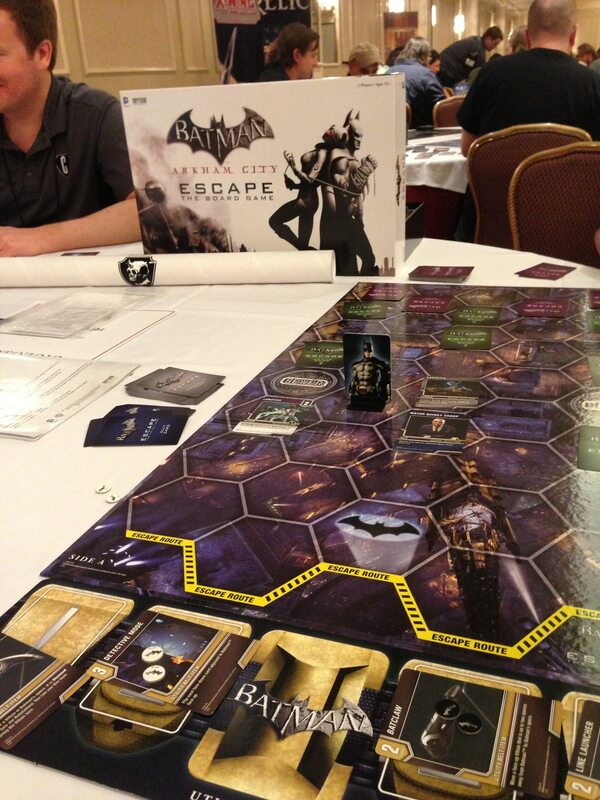 Batman: Arkham City Escape board game is the board game implementation of the Arkham City video game. This head-to-head game pits Batman against a horde of villains seeking freedom beyond Arkham City. 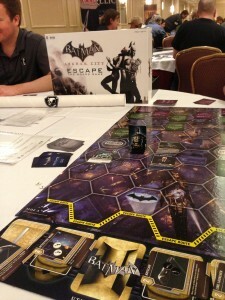 Villains slowly march towards the bottom of the board while the Batman player moves about and either blocks movement or pounds escapees into submission. Whomever achieves the most points at their respective tasks wins. I got an extended look at game night and the game play is fun and quite quick. Besides the Pathfinder RPG, Paizo is branching into the deck-building genre with the “Pathfinder Adventure Card Game.” Slated for a Gen Con 2013 release, it will have a $59.99 MSRP and 500 cards in the first set. The RPG will release in September, but there is no definitive release date. The player’s handbook goes into beta test next week. The books will be soft bound and Wyrd made a strong effort to make sure the RPG Kickstarter levels do not adversely impact retailer sales. Mack Martin, the RPG’s designer also mentioned the RPG has rules to convert an RPG character to a Malifaux miniature stat card, so you can play your PC in the skirmish game. I am not a miniature player, but Malifaux is a fun world that would make a great RPG. I asked (actually begged) to get into the beta. We shall see if I am successful. 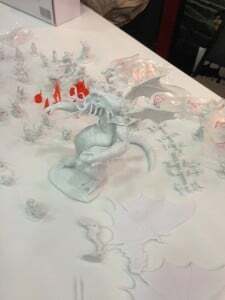 Reaper’s wildly successful kickstarter project bore fruit in the shape of dozens of miniatures. Though I am not a miniatures collector it impressed me with both quality and quantity. Reaper has 18,000 units to ship for the kickstarter before they start working on selling to non-kickstarter buyers. Shipping starts next week and will take 4-6 weeks to complete! AEG released their new “Trains” game which uses standard train-game mechanics fused with deck building. 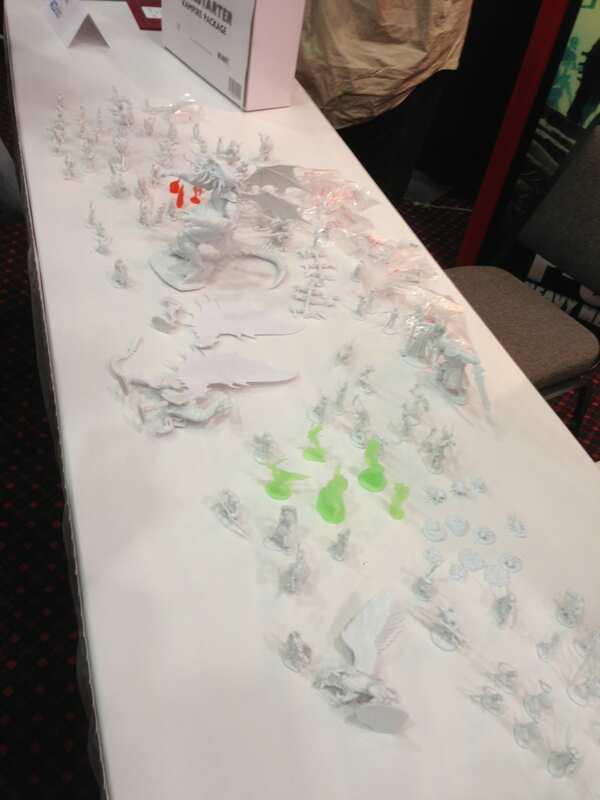 They also had the complete set of “City of Tempest” games on display. Essentially, AEG is releasing a series of mechanically different, but similarly themed games all set in the renaissance-era city of Tempest. I have review copies of these games and will be doing a more thorough review in future. Worra Realms is a kickstarted card-based RPG that replaces conventional character sheets and dungeon maps with card decks. There are two kinds of decks, a $60.00 DM deck has the DM-specific cards and four PC decks. Individual PC decks are $15.00. There are blind booster packs with cards available for both specific classes and more general items. “Tiny Zombies” is a new zombie survival board game being kickstarted by Nord. 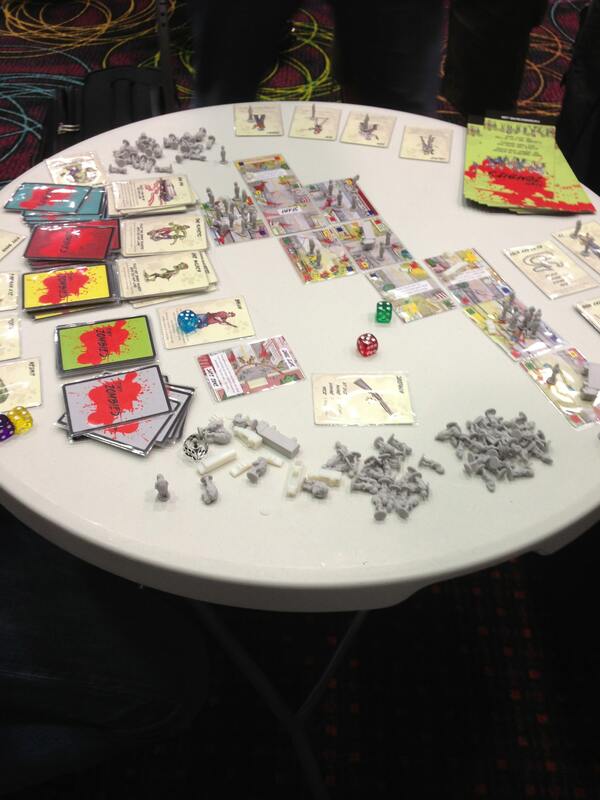 One fun mechanic is dead players rise as zombies and start stalking their former allies! GTS is moving into the importing business with “I Am Vlaa.” Players all strive to earn the title of Vlad with small party of adventurers. There are three victory conditions, hold the center board space for with turns, kill everyone else or last man standing. A set of cards for each PC gives them abilities and combat skills. A neat mechanic involves different effect at night or during the day as the game cycles between both. It is hard to see in the pictures, but the damage tracking wheels have an interior counting track that you just move to the top of the dial and this does the math for you when you take a hit. A useful tool for late night games! 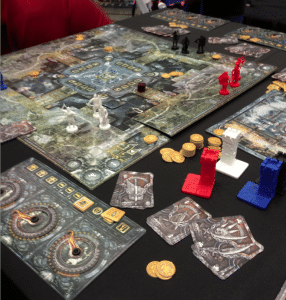 This GTS-exclusive game is a Romanian import and it is now in distribution for a $90.00 MSRP.